The 2018-19 NBA regular season is coming to an end in the next week. The regular season concludes on April 10th 2019 and the NBA playoffs get underway on April 13th 2019. A lot of NBA fans say the basketball season doesn’t even start until we’re in the playoffs, as that’s when the games count and you get the best effort out of the players. NBA Championship Futures: Always the most popular futures bet, betting on who will win the title is enticing to even the most casual NBA bettors. NBA Conference Winners: Don’t want to sweat the NBA finals? Bet on a team to win the Eastern or Western conference instead at lower payout odds. NBA Series Betting: Think you can predict who will win a series? You can bet on a team to win a series, bet on how many games a series will last or bet on a team to win a series in X number of games (IE: Warriors to sweep the Spurs 4-0). NBA Playoff Props: Bookies will often release some exotic playoff-long props prior to the start of the NBA playoffs every season. An example would be betting on the Warriors to sweep every round, which will unlikely, is definitely possible. One tip I have if you’re going to bet on NBA series is to wait if you like a big favorite. The big favorites are priced crazily in the series betting market before a series starts, but if the team loses a game or two at home to open the series you can get a way better price. Bookmakers will adjust the series winner odds after every game and this futures bet will be available until the series is over, meaning you don’t need to always bet immediately. Like in other sports, such as the NHL, when the playoffs come around in the NBA there’s often value targeting underdogs that aren’t getting any love from the public. There are lots of bettors that simply bet on name recognition, but that won’t work ATS. Take last year’s NBA playoffs for example. Golden State and Cleveland played in the finals, but they went a combined 21-22 ATS in the playoffs. The two best teams ATS last season were the Pacers (6-1 ATS) and Pelicans (7-2 ATS). It’s often best to take the points. The over is often overvalued in the playoffs too. Teams tighten up on defense for the full 48 minutes in the playoffs. Two of the most potent offenses (GSW and Houston) only hit the over 13 times in 38 playoff games last year. If you simply bet the under in every game the Warriors and Rockets played you would have made a killing in the playoffs last year. 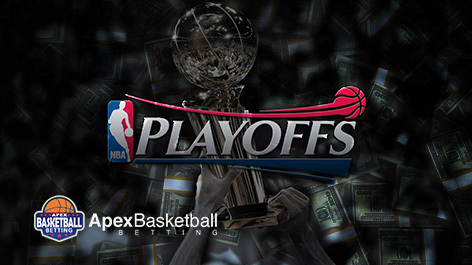 With all of the NBA playoff games being televised, it’s the perfect time to bet in-play. If you’ve never bet live as a game was being played it couldn’t be more exciting. In the NBA there are a lot of swings too, which presents lots of live betting opportunities. I’ll leave you with my best bet to win the 2019 NBA Championship. Golden State (-220) are odds-on favorites to win another ring, but there’s no value betting on them at these odds. Can Houston or Denver advance out of the West? If both teams stay healthy there’s a chance, but the Warriors are going to be even stronger than last year now that they have a healthy DeMarcus Cousins in the starting line-up. I’m going with a team in the East, as hopefully the Warriors have a tough time navigating through the West, which could give one of the top teams in the East a fighting chance. My bet is on the Toronto Raptors (+1000). The Raptors are playing great basketball right now and Kawhi Leonard is having a career year statistically. Leonard should be rested, as his load was limited this season and the Raptors have a lot of depth behind him. Toronto and Milwaukee are the only two teams in the NBA to rank in the top 5 in offensive and defensive efficiency this season. The Bucks are going to be a tough out in the East, but the Raptors can beat them in a series if the three-ball is hitting.